Chinese archeologists have found remnants of tea leaves in tea sets unearthed from the family graveyard of the country's first known anthropologist, a man who lived 900 years ago. The finding challenge the traditional theory that infused tea became popular only in modern times, said Zhang Yun, a researcher with Shaanxi Provincial Institute of Archeology. Chinese archeologists have found remnants of tea leaves in tea sets unearthed from the family graveyard of the country's first known anthropologist, a man who lived 900 years ago. The finding challenge the traditional theory that infused tea became popular only in modern times. Pieces of green tea were found in a dozen bronze, porcelain and stone tea sets unearthed from a cluster of 29 tombs in Lantian County, he said. 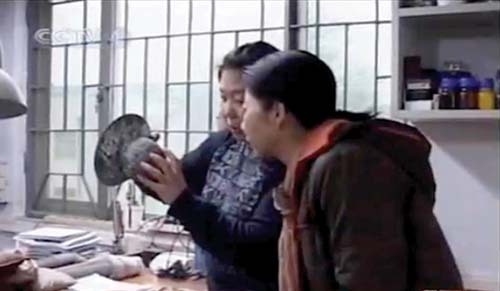 Zhang led the excavations that lasted from December 2007 to December 2009, which produced a variety of sacrificial objects. "In one of the tea sets, which contained a bronze cup and a filler that filters tea, we found about 20 pieces of remnants of tea leaves," said Zhang. "The tea leaf remains green, a sign that it was infused instead of boiled before it was served." The archeologists also found stone kettles next to the tea sets. "These, too, were common kitchen utensils because water boiled in stone kettles was considered tasteless and therefore ideal for preserving the fragrance of the tea." Zhang and his colleagues assumed the family loved tea, so family members were buried with their tea cups hoping they'd still be able to enjoy tea in the afterlife. Besides the tea sets, Zhang and his colleagues also found liquor cups, incense burners and inkstones in the tombs. "These were essential items for Chinese intellectuals in the old days," said Zhang. Several epitaphs were engraved with Lu Dalin's name, evidence that these tombs, including 20 for adults and nine for children, were Lu's family tombs. Lu Dalin (1044-1091) lived in Lantian County throughout his life. He was the first in China to study ancient writings and bronze ware and is therefore recognized as the forefather of Chinese anthropologists. The epitaphs suggested five generations of the family, including Lu himself, were buried at the site from 1074 to 1111, said Zhang. The discovery of the tomb was listed as one of the six most important archeological finds in China last year.